Qualmark New Zealand Limited is New Zealand tourism’s official quality agency. Some of our accommodation and activities listings will be Qualmark rated. This is an independent rating that has been set up to guide you about just what to expect. 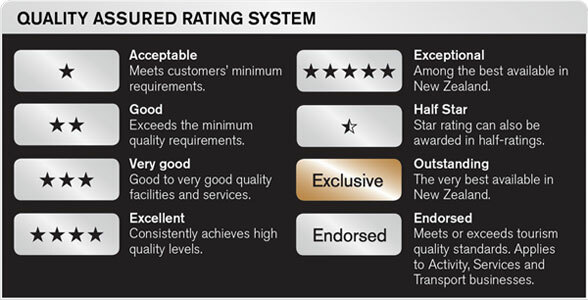 The Qualmark system operates on a 1-star to 5-star scale. Each star level represents a combined range of facilities and service quality and standards for that specific business. Within each star grading, those offering a better range and quality of facilities and services are recognised with a “plus”. Qualmark is working with tourism businesses such as Host Accommodation to help maintain New Zealand’s reputation for environmental excellence. Qualmark Green is environmental verification for Qualmark businesses. In addition to an assessment on overall quality, every business with a Qualmark is assessed on their environmental and social initiatives. 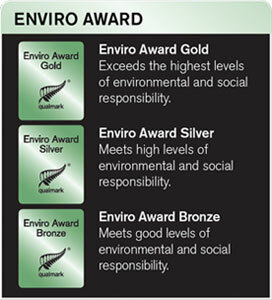 Look out for the Qualmark Enviro-Bronze, Silver or Gold logos displayed next to star grading or endorsed logos.